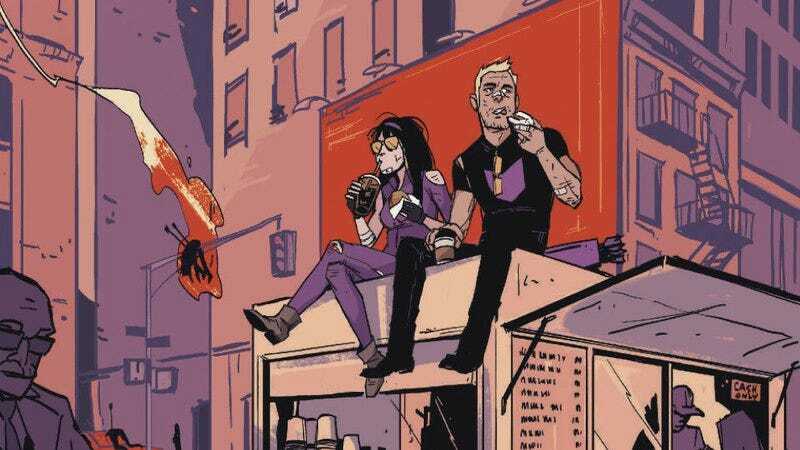 Matt Fraction and David Aja’s Hawkeye run has yet to end (the final issue will be released in July), but readers aching for more archer superhero action have a strong replacement in All-New Hawkeye by writer Jeff Lemire, artist Ramón Pérez, and colorist Ian Herring. The book has a much different feel than the previous run, but the most important thing about Fraction and Aja’s Hawkeye is that it represents the unique perspective of its creators, and that’s what the new series does. Lemire made his career telling intimate stories in a rural setting with his Essex County graphic novels, and he brings that element to All-New Hawkeye by incorporating flashbacks to Clint’s childhood as the two Hawkeyes engage in exhilarating superhero action in the present. Distinctions between past and present are beautifully reflected in the artwork, which uses flowing layouts and heightened colors to give the flashbacks a dreamy quality. This distinction is clear in this preview of next week’s All-New Hawkeye #3, which shows snapshots of Clint and his brother Barney playing around at the circus in the past while Clint and Kate chat with Maria Hill in the present. The images of the past have delicate painted colors, no inks, and no panel borders, whereas the scenes in the present are essentially the complete opposite visually. It’s a great way of highlighting the versatility of Pérez while playing to Lemire’s strengths as a storyteller, maintaining the high level of quality established by the previous run without retreading the same ground.